Reed is 10 minutes away from downtown Portland, Oregon. Crisscrossed by bike paths, public transportation, and bridges, Portland is home to an inspiring music scene, internationally recognized museums and galleries, and Powell’s, the largest independent bookstore in the world. Portland International Airport is 20 minutes from campus. Colleges, Programs, and Degrees: Reed College offers a Bachelor of Arts degree in 26 departmental majors, 13 interdisciplinary areas, and several dual-degree (3-2) programs in Engineering, Forestry, and Visual Arts. Geographic Diversity: 11% of Reed’s student body is international. 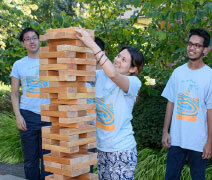 International Student Services: At Reed, the International Student Services (ISS) office provides resources and programs to help international students acclimate to life in the US and thrive at Reed. The office also facilitates each student’s ability to share their diverse culture with the rest of the College community. Programs include immigration advising and support, the Interconnect Peer Mentor Program, and a Host Family Program. Test Score Requirements: All applicants are required to submit either the SAT or the ACT. Submission of the TOEFL or IELTS is recommended for students who have studied in a non-English-speaking school. For more than a century, the College has been a haven for a diverse group of scholars who wrestle with big ideas and explore ways to apply those ideas to the world around them. Learning is cherished at Reed; it isn’t outside the norm to talk about your passions and discoveries. If you’re ready to look beyond the superficial, to seek the truth and discover unlimited possibilities, you’re ready for Reed. Asking questions is a social activity for Reedies. You’ll overhear heated debates about Plato in the Sports Center and get caught up in string theory on the Quad. Whoever you are (even if you’re still deciding who that is), you’ll find that the Honor Principle supports differences and creates respect within the Reed community. Reed is a humanizing place of infinite subsets that offer you the opportunity to be yourself across all your interests. You’ll find your tribe in the classroom, exploring Reed Canyon, or hiking in the Cascade Mountains. Four years of college can seem like a long time and paradoxically no time at all, but your time at Reed will leave an imprint on you that will extend throughout your life; once a Reedie, always a Reedie. Exposure to the primary disciplines of human knowledge prepares graduates to go on to fascinating professions in science, art, medicine, global politics, education, and the environment. 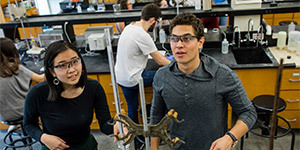 Reed ranks among the top undergraduate institutions in the nation in the percentage of graduates going on to earn PhDs in Physics (ranked #3) and the life sciences (ranked #2). ISS helps F-1 and J-1 visa students with immigration regulations and related procedures, provides guidance on maintaining visa status, and helps students navigate work authorization post-graduation. ISS is the primary liaison between international students and the federal government and local agencies for immigration-related matters. Interconnect Peer Mentor Program Reed’s InterConnect Program matches new international students with current Reed students and a cohort of their peers to develop community, ease the transition to Reed, and provide leadership opportunities. Once a month, ISS provides international students with an opportunity to explore off campus and see a new part of Portland or experience a unique side of US culture. The Summer Experience Award offers funding to students on F-1 visas so they can pursue unpaid summer internships. Reed’s Host Family Program is a nonresidential program designed to introduce international students to a local family who will welcome them to the Portland community, support their experience at Reed, and enjoy the opportunity for cultural exchange. Curious about what Reedies go on to do?